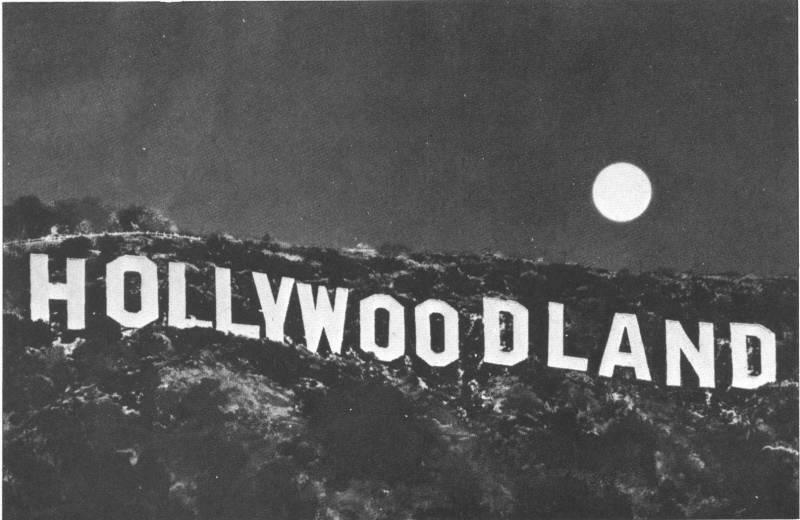 Today I found out the Hollywood sign originally read “HOLLYWOODLAND” and was lit with about 4,000, 20 watt light bulbs, which would flash “HOLLY” then “WOOD” then “LAND” then “HOLLYWOODLAND” repeatedly. The sign was originally put up in 1923 to promote a housing development. The owner of Crescent Sign Company, Thomas Fisk Goff, designed the sign itself, making the letters about 50 ft. tall by 30 ft. wide and embedding about 4,000, 20 watt light bulbs in the sign to light it up and flash as described above. The sign cost about $21,000 to make and put up (about $265,000 today) and was expected to last about a year to two years. 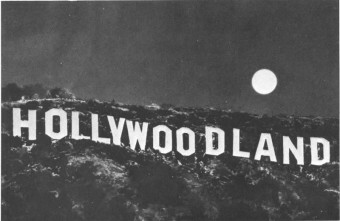 The “LAND” portion of the sign was taken off in the late 1940s when the Hollywood Chamber of Commerce in conjunction with the L.A. Parks Department began efforts to repair the seriously deteriorated sign which had been abandoned by the Hollywoodland real estate group in the 1930s due to the Great Depression. With the “LAND” part gone, it would now be a symbol for all of Hollywood, rather than a housing development. The lights were removed in the renovation as the Parks Department didn’t want to pay for the electricity or replacement bulbs, so stipulated that the Chamber of Commerce would have to pay if they wanted to keep them. They opted not to. The new sign was unveiled on November 14, 1978 and has stood to this day, though the letters were repainted in 2005. The name “Hollywood”, for the town, was probably suggested by Daeida Wilcox, wife of Harvey Wilcox. Depending on which story you want to believe, Daeida either got the name from a Chicago woman who she sat next to on a train or a neighbor. According to the “train” story, the woman had a summer home that she mentioned to Daeida called “Hollywood”. In the “neighbor” story, the neighbor had a home in Holly Canyon called Hollywood. Whatever the case, Daeida loved the name so in turn named her and her husband’s new ranch “Hollywood”. The two later planned out a town on their property with Daeida landscaping the lots to be sold and naming the streets and sidewalks. The first such sidewalk was just a short distance from their house and is only a few meters away from what is now the Hollywood Walk of Fame. For her significant role in planning out the original Hollywood town, Daeida is known as the “Mother of Hollywood”. While he may or may not have come up with the name “Hollywood”, H.J. Whitley is known as the “Father of Hollywood” for his part in developing the region. He also founded or was involved in the founding of over 140 other towns across the United States. 24 year old actress Peg Entwistle committed suicide by jumping from the H in the Hollywood sign in 1932. Her body was found on September 18th of that year and later identified by her uncle who she had been staying with before disappearing two days before her body was found. She had a suicide note on her stating, “I am afraid, I am a coward. I am sorry for everything. If I had done this a long time ago, it would have saved a lot of pain. P.E.” She had become increasingly disheartened by her inability to become a star and her lack of prospects. Sadly ironic was the fact that the day after her body was found a letter arrived offering her the lead role in a play about a woman who was driven to suicide. Famed Hollywood sign prankster Daniel Finegood once slightly modified the Hollywood sign with coverings so that it read “HOLLYWEED”. This was for a school project on Jan. 1, 1976, which he received an A on. Another modification he and his friends did was to change it to “HOL YWOOD” during Easter of 1977. He also once attempted to change it to “OIL WAR”, referencing the Gulf War, but park rangers noticed the modification almost immediately and before daylight hit removed the plastic he and his friends had used to make the modification. Today such attempts to vandalize or modify the way the sign looks without permission is not only illegal, but extremely difficult to pull off due to cameras and motion sensors which are now pointed at the sign 24 hours a day and instantly alert the police if anything or anyone is detected approaching restricted sections around the sign. The original letters for the sign were sold in 2005 on eBay to Bill Mack. In 1983, a group got permission to modify the HOLLYWOOD sign’s display to make it say “GO NAVY”, before the Army-Navy football game.